He met with Minister of Planning / Minister of Trade Agency , Salman Jumaili , Wednesday, Ambassador of Australia in Iraq Joan Lunds, to discuss measures Andham Iraq to the World Trade Organization. The ministry said in a statement received by the "Economy News" that "the meeting discussed ways of joint cooperation between the two countries as well as cooperation in a number of areas, offering trade, investment, agricultural, cultural and scientific relations." The transfer of the statement from Jumaili as saying that "Iraq has become the day represents a stability factor in the region , and therefore it is a promising investment environment that can attract a lot of companies and investors to take advantage of these opportunities." He pointed out that "bilateral relations between the two countries are developing steadily, because Australia is one of the important sources of wheat supply to Iraq and there are good prospects for strengthening these relations through increasing the volume of trade exchange and benefiting from the Australian capabilities in supporting the Iraqi government's efforts in reconstruction and upgrading the services provided For citizens and the development of agriculture ". He added that "Iraq is dealing with all countries on the basis of equality of relations within the network of interests governed by international law," calling "the Australian side to support Iraq in his bid to join the World Trade Organization," adding that the accession process is important in facilitating the movement of trade and goods within World Trade Agreement. From its part , expressed the the Ambassador of the Australian Lunds, expressed "willingness of its government to provide all kinds of support for Iraq , which is economically, geographically and politically weight important at the level of the region and the world," noting that it "will provide possible support for Iraq 's accession to the WTO." called on the Minister of Planning and Minister of Trade Agency, Salman al - Jumaili, on Wednesday, the Australian Ambassador to support Iraq in its efforts to join the World Trade Organization. "The Minister of Planning and Trade Minister, Salman Jumaili, met with the Australian Ambassador to Iraq, Joan Lundes. The meeting was attended by Trade Undersecretary Haitham Al-Khashali and the Director General of Foreign Relations in the Ministry. .
During the meeting, they discussed prospects for joint cooperation between the two countries in a number of fields, particularly trade, investment, agricultural, cultural and scientific relations. "Iraq is now a stabilizing factor in the region and therefore it is a promising investment environment that can attract many companies and investors to take advantage of these opportunities," Jumaili said. He pointed out that "the bilateral relations between the two countries in a steady development, because Australia is one of the important sources of wheat supply to Iraq and there are good prospects to strengthen these relations through increasing the volume of trade exchange, and to benefit from Australian capabilities in support of the Iraqi government's efforts in the reconstruction and upgrading services Introduction to Citizens and Development of Agriculture ". Al-Jumaili pointed out that "Iraq is dealing with all countries on the basis of equality of relations within the network of interests governed by international law," calling on the Australian side to "support Iraq in its bid to join the World Trade Organization, which is so important in facilitating the movement of trade and goods within the Trade Agreement Global ". For her part, Australian Ambassador Lundis expressed "the readiness of her government to provide all kinds of support for Iraq, which represents an important economic, geographic and political weight in the region and the world," adding that "Australia will provide possible support for Iraq's accession to the World Trade Organization." BAGHDAD, June 14 (KUNA) - The Minister of Commerce and the Australian Ambassador to Iraq Joan Lundes discussed bilateral cooperation in a number of fields, including trade, investment, agricultural, cultural and scientific relations, as well as supporting Iraq to join the World Trade Organization . "Iraq is now a stabilizing factor in the region and therefore it is a promising investment environment that can attract many companies and investors to take advantage of these opportunities," a statement issued by the media office said. One of the important sources of wheat supply to Iraq and there are good prospects to strengthen these relations through increasing the volume of trade exchange, and benefit from Australian capabilities in support of the Iraqi government's efforts in the reconstruction and upgrading the services provided to citizens and development of agriculture and Iraq deals with All countries on the basis of equality of relations within the network of interests governed by international law. " Iraq called on the Australian side to "support it in its bid to join the World Trade Organization, because it is important to facilitate the movement of trade and goods within the World Trade Agreement." The Minister of Planning and Trade Minister Salman Jumaili on Wednesday met Australian Ambassador to Iraq Joan Lundes to discuss Iraq's accession to the World Trade Organization (WTO). The statement quoted Jumaili as saying that "Iraq is now a stabilizing factor in the region and therefore is a promising investment environment that can attract a lot of companies and investors to take advantage of these opportunities available." For her part, Australian Ambassador Lundis expressed "the readiness of her government to provide all kinds of support to Iraq, which represents an important economic, geographical and political weight in the region and the world," adding that it "will provide possible support for Iraq's accession to the WTO." "Minister of Planning / Minister of Commerce Salman Jumaili discussed today with the Minister of Foreign Trade and Development Cooperation of the Netherlands, Sekhirid Kach, and the accompanying delegation to promote joint cooperation in various fields and bilateral relations between the two countries," the ministry said in a statement received by Al-Ghad Press, . Jumaili said, "I am happy to visit," praising "the position of the Dutch government and its support for Iraq in the international coalition and help him to cross his ordeal by fighting a preacher." "The Netherlands, through its presence in the European Union, was very supportive of Iraq," he said, adding that "there are many areas of cooperation more broadly and we are happy that Iraq is the subject of interest of the Netherlands." The statement said that "
Al-Jumaili said that "a number of Dutch experts will arrive in Baghdad to present their expertise in the area of water scarcity," adding that "Iraq has asked the Dutch government support and support to join the World Trade Organization." The statement added that "the meeting included the discussion of the activation of the joint agreement between the two countries, which took place in 1983," stressing that "this visit indicates that the international community stands by Iraq." "Iraq today is working to regain its role to be the center of interest of the world and important countries, whether in Europe or America or Asia." 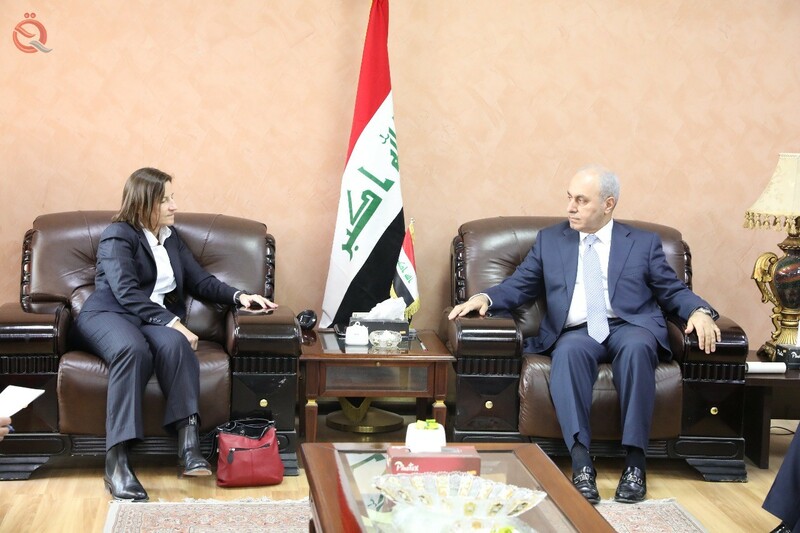 For her part, praised the Minister of Foreign Trade and Development Cooperation, Dutch Sekhirid Kakh, "Iraq's efforts in the fight against it," indicating that "the Dutch government has provided its support in this regard to the Iraqi government in the field of security support." "This support will develop in the future to economic, commercial and other support, as well as help displaced people to return to their areas and help young people find jobs," she said.